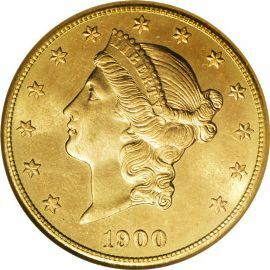 The Liberty Double Eagle (Type 3) was issued at the US Mint from 1877 to 1907. 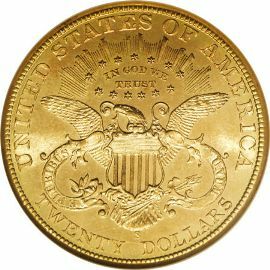 Legislation was passed in February 1849 to mint these twenty dollar gold coins along with the new gold dollars. This Type 3 variety enjoyed continuous production for 31 years. It was the longest run of any coin of this denomination. These coins were minted at five different US Mint facilities, including: Philadelphia, San Francisco, Carson City, New Orleans, and Denver for the last two years in 1906 and 1907.
unchanged. The front of the coin shows a portrait of Liberty inspired by a Greco Roman sculpture and designed by James B. Longacre. Liberty is surrounded by 13 stars, and has the date positioned below. the reverse was the inscription for the denomination. Chief engraver William Barber decided to change it from "TWENTY D." to "TWENTY DOLLARS". His decision was supported and continued to the end of the series in 1907.